I moved to the USA in 2013 and my life turned upside down. These were a new place, new people, and new culture. I have many experiences to remember good and bad both. One of the best things happened to me was I got a chance to follow my dream and became the blogger. In November 2013, I came to know about Thanksgiving, but I thought it’s all about the sale and Black Friday deals. When I came in contact with the Americans then I realize it is actually celebration in which family members come together and have a feast. It is the way to say “THANKS” for all they have done for you and being in your life. When I search, online I found different stories about “Thanksgiving”. Some say this festival was celebrated by native Americans and so the tradition continues from their forefathers. Few people say it is the way to celebrate Harvest Festival. The Thanksgiving history also includes English men’s arrival to America and their doings. 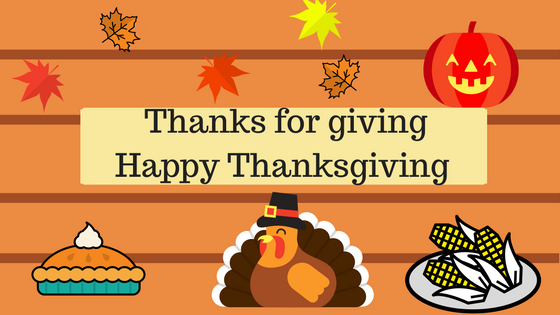 On this Thanksgiving, I want to say thanks to my readers and subscribers to all the love they gave to me. Thank you so much for supporting me for my work. Thanks for reading my articles and giving your feedbacks. You all give me the reason to stay motivated and write articles. Once again thank you so much for everything. Enjoy this “Thanksgiving” with your family and friends. Have fun. If you missed any post for November Check out here. This is awesome, yeah your right it really important to Shared the goodness specially to your love one. I like your blog keep posting good things👍. Interesting baby image my dear. These variations go nice together for its purpose. Appreciate you for sharing this nice post.